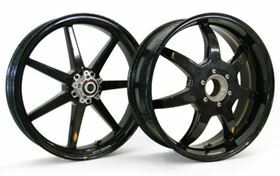 BST selected ACG's medium temperature moulding prepregs for its autoclave processed carbon composite motorcycle wheels. The BST wheels are reported to result in a typical weight saving of 47% over their conventional aluminium counterparts, with no decrease in strength. ACG’s high Tg MTM®58B prepreg is used for the rim of the wheel and structural MTM®57 prepreg for the integral spokes. a beautiful carbon fibre finish in high gloss. ACG, part of Umeco Composites Structural Materials (UCSM), a division of Umeco plc, offers a range of prepreg systems for structural and tooling applications. Carbon fiber company Umatex Rosatom, based in Russia, has partnered with an Italian motorcycle racing team.